Which part of the world are te from? Um, what is the purpose of this club, exactly? 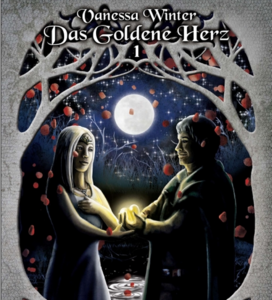 For a chance to win a signed copy of The Golden cuore English Edition tweet my book trailer and mention @winter_vanessa - te can find the trailer here: https://www.youtube.com/watch?v=wsSNgCD7gq0. te can also share it on any other social networking page, but te need to give me a link to them / inform me/ tag me. #TheGoldenHeart English Paperback Edition (SIGNED, WITH GIFT, WORLDWIDE DELIVERY) now available for preorder on E-Bay! Hardcover & E-Book Editions still to follow. Thank te for checking this articolo out :) I hope you'll get to buy the book and like it. After only having been offered an E-Book release da the big publishing house and having some issues with the other because of wanting to keep certain rights, I decided to self-publish. Considering the fact that the publishing house that ultimately was going to release it seemed a little fishy to me, I guess it's for the best. Right now a very kind editor and fellow writer is working on my story. A cartographer is creating a map for me. Already have the covers planned and everything so it's all good. - A lot of the names were randomized. In these cases I had a name before I formed a personality out of it. - Some of the randomized names were: Ian, Notin & Aura. As a "Thank You" for your support I want to update te about some things. The Gods decided to name the months after themselves and the provinces. In each mese there is a holiday celebrating the namesake God/Province. The word "Ager" is pronounced like the English word "Age" just with an additional "R". It means "field, landscape, acre". As te can guess da its meaning there are many farms in Ager. Parts of Germany were formed to become this province in the anno of the Great Change. Population: Mainly Earth- & Non-Magi, but also other types of Magi. unisciti and make America50 happy =) It's all about Draghi on there. a comment was made to the poll: How do te guys like the idea of naming "The Golden Heart" supporters "Soul Mates"? a comment was made to the poll: Which of these names do te like the most? When was the German edition released?